The latest release on Superordinate Music welcomes Cream to the label for his debut single. The Polish artist is fresh off a massive release on Deersky’s Soundteller Records and continues his solo endeavour here with ‘Labyrinth 23’ alongside remixes from Stas Drive and Silinder. ‘Iboga’ was a masterclass in emotive progressive house and ‘Labyrinth 23’ follows suit wonderfully. Backed by warm, fluid grooves and sparkling melodies it’s got all the charm of an old school production with a touch of modern flair. Emotive chord changes power its core while melodic clusters deliver the pixie-like effect. What’s most exciting though is its final act, complete with low end growl and a heightened state for that blissful moment you always hope comes. Great stuff from Cream. A stellar original deserves great remixer selection and Superordinate have certainly delivered here with Stas Drive and Silinder turning in wicked renditions. First up Stas Drive returns to the label following releases on Chapter 24 and his own Spaghetti Monster imprint. Here the Ukrainian artist takes ‘Labyrinth 23’ into his world of tripped out techno. With a deeper sensibility and psychedelic flair the track effortlessly weaves its way through a land of broken motifs and acid warbles. Although downplayed dramatically Stas does incorporate the main themes into the break, albeit in a more subversive, indistinct and very cool manner. The focus remains on a strong rhythmic flow and intriguing design which works as a great complement to the original as a result. Closing the release out is Silinder who is making his second appearance on Superordinate after remixing Stas Drive’s ‘Passage Of Time’ in February of this year. A firm favourite in the underground for years Silinder’s discography also boasts appearances on Hernan Cattaneo’s Sudbeat Music and Movement Recordings. Here he takes ‘Labyrinth 23’ into deeper, hypnotic territory with that classic Silinder cadence. There’s an abundance of mystery in this one from its bassy atmospheres, trippy break and trailing effects, but it’s a slightly heightened third act which seals it’s brilliance and also rounds out the release with a bit of an epic feel. 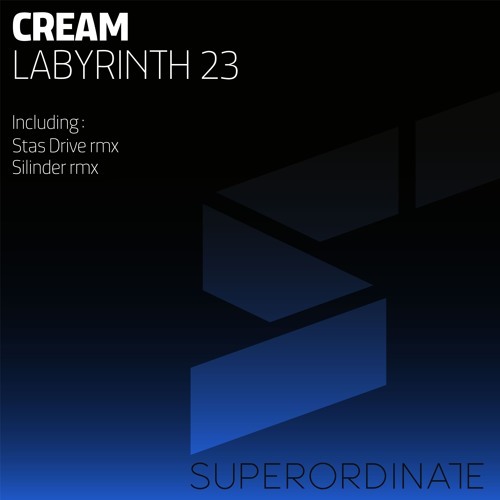 Lovely remix from Silinder and another top release from Superordinate Music.